Centsible Savings: Great Christmas gift idea for "Couponers"! This a post that you need to forward to your husband as a hint for what you want for Christmas! 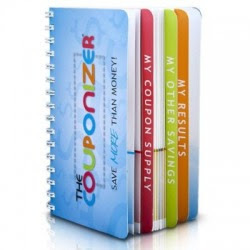 Julie, from Couponizer, sent me The Couponizer to review and try out a few weeks ago. I have to say, I was a little skeptical about how much use I would be able to get from it because I follow the method of filing my inserts by date and only cutting coupons that I need for that week's shopping. But even with that method there are still loose coupons that I cut and don't end up using that I don't know what to do with! They usually ended up in various white envelopes floating around in my purse. And if I needed a coupon that I knew I had cut, I would have to dig through the entire envelope to find it. Well, The Couponizer has solved all of that! 3 gift card/shopper loyalty sleeves (for your CVS, Kroger card, etc. So now when I don't end up using a coupon that I cut, I file it in the corresponding category. And when I need it later, I know right where to find it! If you are a "clipper" ( meaning you cut every coupon and carry them all to the store with you), The Couponizer would be a great tool for you! It is compact and yet has lots of categories and pockets to fit your needs. Ok, so here is the best part: Julie has agreed to let any Centsible Savings readers that would like to order the Couponizer do it for a discount! The Couponizer normally costs $19.95 plus shipping and handling, but she has discounted it to $18.00 plus s/h. Go here to her website to order yours today! If you didn't want it for a Christmas present, this would be a great tool to help you get some of your New Year's resolutions of being more organized done! Good Morning!!! www.centsiblesavings.com is one of the most outstanding informational websites of its kind. I take advantage of reading it every day. www.centsiblesavings.com rocks! Thank you to all that have contacted me to purchase a Couponizer after reading this review. This product does not replace a filing system for those who do alot of clipping. I would say it is for the small to medium user who may use the clipless method. It would not be uncommon to have an empty or nearly empty Couponizer after a shopping trip. Anonymous seems to have the first version of the Couponizer. The one we sell now has a plastic cover and plastic back page for durability.